Even his letters and emails were funny: clever, witty, sharp-edged. Not as polished as the hundreds of opinions, concurrences, and dissents that he filed during his 30 years on the Supreme Court, of course. Justice Scalia knew his true legacy was in his official compositions, and he put in the work, hours of polishing, to make them exactly what he wanted. But the offhand notes he sent to friends and acquaintances—even they were well-written, well-balanced little productions. In the hours after Antonin Scalia’s death on Feb. 13, the newspapers poured out the expected obituaries they had prepared for a Supreme Court justice. The political commentators raged about all Scalia had done to shape American public life: evil, if their political inclination ran against the man, or good, if it ran alongside him. A few of those who loved him published reminiscences of Nino’s Catholicism, his charities, and his kindnesses, while a few of those who hated him posted accounts of his snarls and brush-offs. 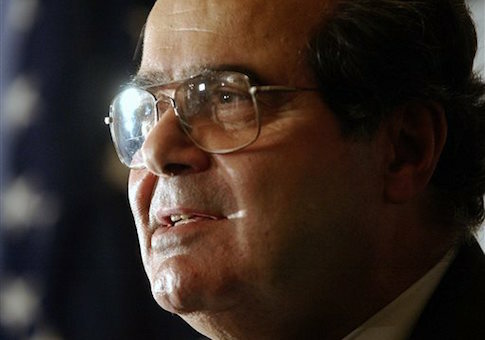 Far too many commentators, on both the Right and the Left, rushed into discussions of the politics of replacing Scalia on the Supreme Court, refusing to take even a moment of the pause offered by the death of others—the memento mori that, in better-mannered days, dictated that the time immediately after death exclude politics and ill-speaking, in equal measure. Nearly everyone, in other words, used the occasion of Justice Scalia’s death as an occasion to claim him as one of their own. He was a political figure, to the politicized. A legal reasoner, as far as the law professors understood him. A Catholic stalwart, for the Catholic bloggers. A roadblock to progress, for the left-leaning commentariat. A principled bulwark, athwart the road to madness, for the right-leaning. In truth, he was large, a man so bulky, that it remains hard to see more than a single side of him at a time, and even the days after his death we tend to think that he must have primarily figured in the landscapes we know best. One angle from which he seems to be insufficiently considered, however, is that of a writer—since Justice Scalia was the most consequential American author of the last thirty years. Who else wrote like this? The small handful of people with his level of prose—novelists, poets, a few essayists, maybe—rarely produced change in public life. The small handful with his level of power—presidents, senators, movers and shakers—never matched his writing skill. Scalia started out in public life as something of a political lawyer, serving as an assistant attorney general in the Office of Legal Counsel for Nixon and Ford. He was disappointed when Ronald Reagan passed him over, naming Rex Lee solicitor general in 1981. But the loss would eventually prove a gain. Once Reagan nominated him for the Supreme Court in 1986, Scalia was set free from the grind of partisan policies and political advocacy. He was confirmed on a unanimous vote of 98–0, in part because the Senate was exhausted by the wranglings of its previous vote on Chief Justice Rehnquist, and in part because he had been fairly careful to avoid writing the endless legal essays that would provide ammunition to the opponents of the next nominee, Robert Bork. And there on the Court, he could finally write what he wanted, maintain his principles, and develop the legal theories he thought important. John Marshall, Oliver Wendell Holmes, Benjamin Cardozo, Robert Jackson: These are names that appear on lists of Supreme Court justices who wrote well. And maybe what’s most interesting about those justices is that they tended to write in ways that could be followed and appreciated by non-lawyers. Jackson more than Cardozo, perhaps, but generally the justices we enjoy reading are the justices who intended their work to be read outside the judiciary. To weigh them as writers is to be forced to ask the question of audience—to ask the identity of the readers they hoped to reach. In his early opinions, Scalia tended to address his fellow justices. His temperament and his legal philosophy would never allow him to be a bridge-builder, the way Sandra Day O’Connor wanted to be: writing less than ideal opinions to gain consensus. But he did want to persuade the other members of the Court to stop the slide toward loose reasoning about the Constitution. In some ways he was successful. Before Scalia joined the Court, it was common to seek in legislative history a way to interpret statutes. Scalia’s insistence on the actual text of regulations, his sneer at cherrypicking legislative speeches, changed the shape of opinion writing from the Supreme Court on down. His constitutional originalism was generally less successful, however important his thought proved when he returned to the text of the Constitution in its historical setting to overturn years of gun control with the Heller decision. But it was precisely in those constitutional defeats that he began to shift toward a larger audience of law students trained up in the Federalist Society, intellectualized lawyers and lower-court judges, and the commenting class of American observers. After a period of gloom midway through the Clinton administration—a period in which the sarcasm of his dissents reached a dark and probably unhelpful perfection—he began to write for an expanded class of readers, trying to set in place not just legal but cultural markers. He maintained a set of favored rhetorical tricks, easily recognizable in most of his more widely quoted passages—and one can find them even in his personal letters. He liked to use capital letters ironically, for example, and he loved—too much, I think—to construct sarcasm out of complex adjectives. Think how often you’ve read in Scalia something like "whatever-it-takes jurisprudence." Or "give-it-a-try litigation." Or (one of my favorites) "the sweet-mystery-of-life passage." Or (one of my least favorites) "a standard of ‘grossly-excessive-that-means-something-even-worse-then-unreasonable.’" "Throw-in-the-towel approach," "it-is-so-because-we-say-so jurisprudence"—he would employ the construction for any occasion, and he got about as much mileage from it as any writer has ever managed. It’s in his metaphors, though, that Scalia’s goals as a writer are clearest. His single best sentence may be this, from the 1993 Lamb’s Chapel case: "Like some ghoul in a late-night horror movie that repeatedly sits up in its grave and shuffles abroad, after being repeatedly killed and buried, [the Lemon test] stalks our Establishment Clause jurisprudence once again, frightening the little children and school attorneys of Center Moriches Union Free School District." And he carried his ghoul metaphor on through several paragraphs, ending, "Such a docile and useful monster is worth keeping around, at least in a somnolent state; one never knows when one might need him." There comes vividly to mind a portrait by Emanuel Leutze that hangs in the Harvard Law School: Roger Brooke Taney, painted in 1859, the 82d year of his life, the 24th of his Chief Justiceship, the second after his opinion in Dred Scott. He is in all black, sitting in a shadowed red armchair, left hand resting upon a pad of paper in his lap, right hand hanging limply, almost lifelessly, beside the inner arm of the chair. He sits facing the viewer and staring straight out. There seems to be on his face, and in his deep-set eyes, an expression of profound sadness and disillusionment. Perhaps he always looked that way, even when dwelling upon the happiest of thoughts. But those of us who know how the lustre of his great Chief Justiceship came to be eclipsed by Dred Scott cannot help believing that he had that case—its already apparent consequences for the Court and its soon-to-be-played-out consequences for the Nation—burning on his mind. I expect that two years earlier he, too, had thought himself "calling the contending sides of national controversy to end their national division by accepting a common mandate rooted in the Constitution." There’s a deep irony in that passage from Casey—as there is in passages all through Scalia’s jurisprudence. He insisted loudly that the Court carry itself softly. He intemperately demanded that judges temper their ambitions to rule as philosopher kings. He immodestly raged against a lack of modesty. He wrote in memorable lines that the best decisions are those that do not strive to impose the writings of the judicial branch, and the elite class of the legal profession, on the nation. He made himself important on the Supreme Court by calling the Court to think of itself as less important. It was irony of which Justice Scalia was well aware. His emails and personal notes were often self-deprecating, mocking his own prose, and in one memorable conversation I had with him about writing, he said that in a different era, he would have written in a different way—conveying through a different style the lesson that the Constitution rises above the social preferences of the elite class that we pay to interpret it. The lesson itself, however, he would not have changed. His writing was like hot iron, with sparks flying off as he worked. But his principles were the anvil on which he hammered out his opinions, and he knew that without the anvil, there would be nothing wrought. This entry was posted in Culture and tagged Supreme Court. Bookmark the permalink.